Los Angeles natives Girlpool have created something of a stir amongst certain underground scenes. Their unique sound has turned heads and they’re continuing to build a solid British fanbase on their current UK tour. It’s quite a coup for Pop Recs to bag a rising American band, particularly since the band are playing such esteemed venues as The Shacklewell Arms and Rough Trade in London on their first trip to England. However, Pop Recs have made a nice habit of landing appearances from some of music’s biggest names and rising stars alike. 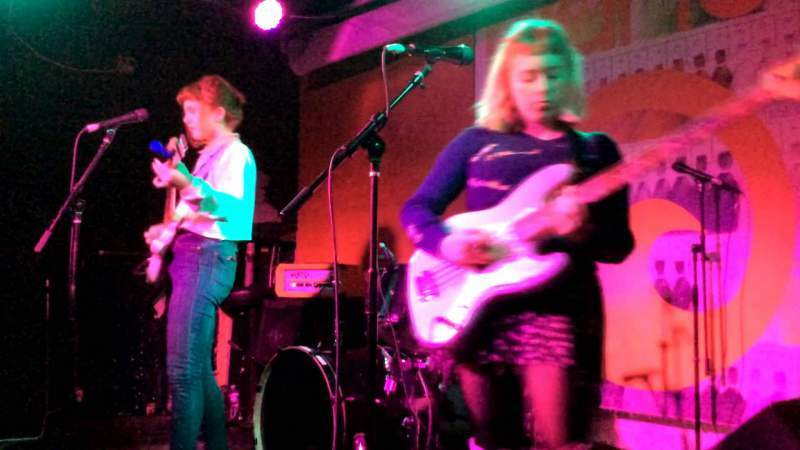 Hosting Girlpool and Iceni continued their impressive streak of live performances. Iceni, Newcastle-based purveyors of slightly funky, slightly disco-infused power pop, are a female trio who pack a definite punch. Liz, Lindsay and Caroline are all wonderfully affable and when they speak between songs their Geordie accents fill the room with humorous anecdotes and gentle but well-meaning prods at each other. Their tunes consist of epic harmonies, funky bass-lines and some terrifyingly good drumming from Caroline. They’re a band who know exactly what they’re about and the type of music they want to make and even in front of the miniature crowd they display a confidence and swagger not usually found in bands with only a single EP to their name. It was almost a shame that they ended with a cover– albeit a very slick cover of Gloria – as their original material is so polished they already sound like the complete package. Girlpool, by contrast, like wallowing in downbeat, stripped-back Americana that speaks to the experiences of young women. Their songs typically revolve around the themes of love, loss and identity but with a deep-set sincerity. Basically, it’s not the type of thing you’d expect from two natives of Los Angeles; that doesn’t make it any less brilliant. Cleo and Harmony sat on chairs on the stage on top of a grubby carpet, completely unassuming and clearly treating the gig as more of a jam session. They have a plethora of songs to pick from – including many from their self-titled debut EP – and so spend their time in-between tunes giggling and quietly discussing what they most want to play. While this could come across as being ill-prepared for the gig, they are particularly genuine and seem to love playing for their own enjoyment as much as the crowd’s. Cleo and Harmony – who play guitar and bass – both have particularly girlish, folk-tinged voices. At times their harmonies sound like something out of the Coen Brothers’ O Brother, Where Art Thou, while at other points they scream and growl in sleazy, delta-blues tones. Their song Jane in particular shows off their scuzzy alt-rock sensibilities; both women shout and yelp over a particularly loud and harsh rock riff. At other times their songs are reminiscent of The Breeders, hovering between bluesy pop-rock and country. The band was unfortunately not particularly helped by their guitars being too loud and their voices too quiet. While it was possible to catch some of their lyrics, they weren’t always clear to the audience – this comes from someone standing at the front of the crowd. It’s a shame because, as their EP demonstrates, their lyrics are deceptively simple, bubbling under with feminine angst and intriguing tales that deserve a better airing. Despite this, Girlpool still proved that they are ones to watch. With a captivating, stripped back performance style, the duo performed what could become a “were you there” moment to the tiny crowd.